Trainers play a vital role in your overall success. These key employees educate and train your new and existing operators on your policies, procedures, processes and safe driving techniques. They also determine whether or not an operator is ready to safely perform the job. Great operators don’t always make the best trainers. Training requires different skills. 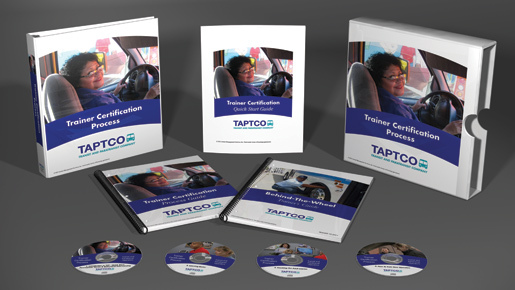 The Trainer Certification Process is a complete toolkit that helps you interview, test, promote and prepare your best candidates to become professional driver trainers. The program explores the fascinating way in which humans learn. It explains the different learning domains and the five levels or knowledge and skill mastery. It lays a solid foundation for anyone who is responsible for teaching other adults professional driving skills. Adult learners want to control their own destiny. They want to be involved in the learning process. Coaching is the preferred methodology for preparing professional operators to safely drive and provide superior customer service. This program teaches coaching techniques, including coaching for excellence and coaching for improved performance. This course details the step-by-step implementation of the TAPTCO Operator Development Course. It covers all aspects of classroom facilitation, closed course exercises and behind-the-wheel skills instruction. It also explains the use of the Operator Daily Performance Checklist to permanently document each trainee’s progress. The trainers have by far the greatest influence over the drivers. They influence the future behavior of the drivers by everything the trainer says and does. But, who trains the trainers? How well are they trained? Do they understand what they can and cannot change in a driver’s behavior? This extensive course has been created to help trainers become as professional as possible and to show them how to shape the future behaviors of the drivers.